Use the Graphics settings (main menu: Edit > Project Settings, then select the Graphics category) to apply global settings for Graphics. See in Glossary should be rendered (instead of using the default rendering pipeline used by Unity). For more information on this feature, see the Scriptable Render Pipeline package documentation. See in Glossary by height or along the Y-axis. Default Sort objects based on the Camera mode. Perspective Sort objects based on perspective view. Orthographic Sort objects based on orthographic view. Custom Axis Sort objects based on the sort mode defined with the Transparency Sort Axis. Transparency Sort Axis Define a custom Transparency Sort Mode. See in Glossary devices, but to disable them on low-tier devices to improve performance. Tiers are defined by Rendering.GraphicsTier. See in Glossary to High, Medium, or Low. Reflection Probes Blending Enable blending on Reflection Probes. Detail Normal Map Enable Detail Normal Map sampling, if assigned. Enable Semitransparent Shadows Enable Semitransparent Shadows. This adds or removes the UNITY_USE_DITHER_MASK_FOR_ALPHABLENDED_SHADOWS shader compiler define. Cascaded Shadows Enable using cascaded shadow maps. This adds or removes the UNITY_NO_SCREENSPACE_SHADOWS shader compiler define. Prefer 32 bit shadow maps Enable 32-bit float shadow map when you are targeting PS4 or platforms using DX11 or DX12. Most platforms have a fixed shadow map format that you can’t adjust. These vary in format, and can be 16-bit, 24-bit, or 32-bit, and can also be either float- or integer-based. 32-bit shadow maps give higher quality shadows than 16-bit, but use increased memory and bandwidth on the GPU. Note: To use 32-bit shadow maps, make sure the depth buffer is also set to 32-bit. Use HDR Enable High Dynamic Range rendering for this tier. See in Glossary is enabled for the current Graphics Tier. By default, this is set to FP16. See in Glossary format, 16-bit floating point per channel. See in Glossary. R and G channels are 11-bit floating point, B channel is 10-bit floating point. See in Glossary Choose how Unity should render graphics. Different rendering paths affect the performance of your game, and how lighting and shading are calculated. Some paths are more suited to different platforms and hardware than others. Deferred rendering is not supported when using Orthographic projection. If the camera’s projection mode is set to Orthographic, these values are overridden, and the camera always uses Forward rendering. For more information, see Rendering Paths. Forward The traditional rendering path. This supports all the typical Unity graphics features (normal maps, per-pixel lights, shadows etc.). However under default settings, only a small number of the brightest lights are rendered in per-pixel lighting mode. The rest of the lights are calculated at object vertices or per-object. See in Glossary has the most lighting and shadow fidelity, and is best suited if you have many realtime lights. It requires a certain level of hardware support. Legacy Vertex Lit Legacy Vertex Lit is the rendering path with the lowest lighting fidelity and no support for realtime shadows. It is a subset of Forward rendering path. Legacy Deferred (light prepass) Legacy Deferred is similar to Deferred Shading, just using a different technique with different trade-offs. It does not support the Unity 5 physically-based standard shader. 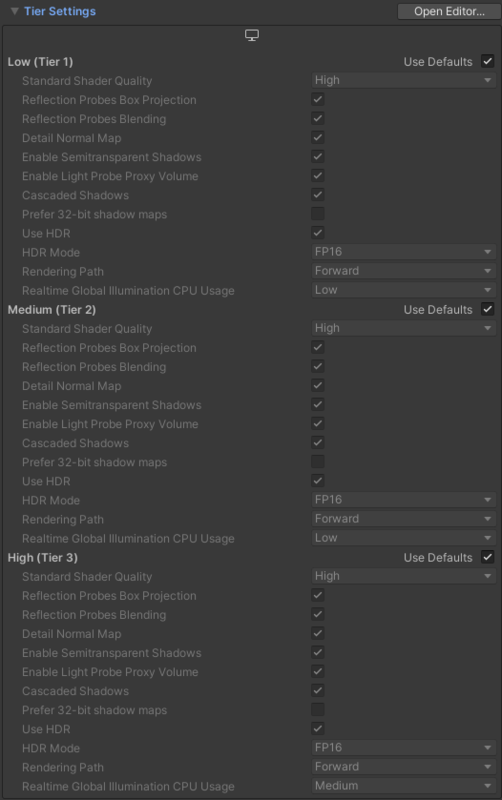 Realtime Global Illumination CPU Usage Choose how much CPU usage to assign to the final lighting calculations at runtime. Increasing this makes the system react faster to changes in lighting at a cost of using more CPU time. Note: Some platforms allow all CPUs to be occupied by worker threads whereas some enforce maximums. For example, Xbox One and PS4 allow a maximum of 4 CPU cores. For Android devices, if it is a bigLittle architecture, only the little CPUs are used; otherwise the maximum is one less than the total number of CPUs. Low 25% of the allowed CPU threads are used as worker threads. Medium 50% of the allowed CPU threads are used as worker threads. High 75% of the allowed CPU threads are used as worker threads. Unlimited 100% of the allowed CPU threads are used as worker threads. 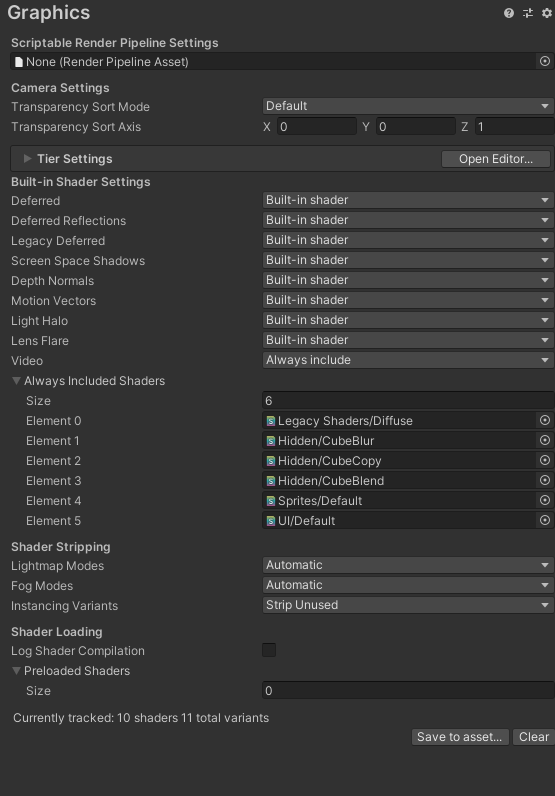 Use these settings to specify which Shader to use for each of the listed built-in features. Deferred Use with Deferred shading. Deferred Reflection Use with Reflection Probes along deferred lighting. Screen Space shadows Use with cascaded shadow maps for directional lights on PC/console platforms. Legacy deferred Use with Legacy Deferred lighting. Motion vectors Use for object-based motion vector calculations. See in Glossary Use with Lens Flares. Light Halo Use with Light Halos. No Support disables this calculation. Use this setting if you are not using deferred shading or lighting. This will save some space in the built game data files. Built-in Shader uses Unity’s built-in Shaders to do the calculation. This is the default. Custom Shader uses your own compatible Shader to do the calculation. This enables you to do deep customization of deferred rendering. See in Glossary reference property appears below the feature property where you can set a reference to the Shader you want to use. Specify a list of Shaders that are always stored along with the Project, even if nothing in your Scene actually uses them. It is important to add Shaders used by streamed AssetBundles to this list to ensure they can be accessed. To add a shader to the list, increase the value in the Size property. To remove the last Shader in the list, decrease the Size property. To remove a Shader which is not the last one in the list, you can set the value to None. Lower your build data size and improve loading times by stripping out certain shaders. However, you can choose specific modes if you are building asset bundles to ensure that the modes you want to use are included. By default, the Lightmap modes property defaults to Automatic, meaning that Unity decides which shader variants to skip. By default, the Fog Modes property defaults to Automatic, meaning that Unity decides which shader variants to skip. See in Glossary in the Scene. You can use the Instancing Variants property to override the default stripping behavior. Strip Unused (Default value) When Unity builds a Project, it only includes instancing Shader variants if at least one Material referencing the Shader has Enable instancing enabled. Unity strips any Shaders that are not referenced by Materials with Enable instancing disabled. Strip All Strip all instancing Shader variants, even if they are being used. Keep All Keep all instancing Shader variants, even if they are not being used. See in Glossary to preload while loading the game. Shader variants specified in this list are loaded during entire lifetime of the application. Use it for preloading very frequently used shaders. See Optimizing Shader Load Time page for details. To add a shader variant collection to the list, increase the value in the Size property.